Hey everyone and thanks for visiting our page! I’m excited to be a part of the team this year and hope that you’ll keep following us here. My name is Myra Liu. I was born in Houston, TX; raised in Arlington, TX – conveniently the home of the ORIGINAL Six Flags, Ballpark in Arlington (Texas Rangers), and now the Cowboys Stadium. I graduated from Princeton University, additionally the alma mater to Woodrow Wilson, Brooke Shields, and Michelle Obama (and Ed!). After several years of enjoying the Northeast, but wondering why I was so far from home, I came back to Texas and have been fortunate enough to begin my studies this year at UTHSCSA’s medical school. 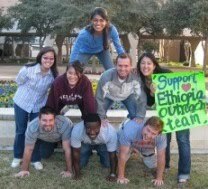 Although I have never been on an international missions trip, I am looking forward to the opportunity of providing health resources and care to the people of rural Ethiopia. One of the reasons I chose to become a doctor was simply to help others. “Others” does not merely mean the people within my community, but rather people everywhere. Furthermore, I believe it is important that I, coming from a wealthy, resource rich nation, help those in less developed nations. At the same time, I know there is much to learn from them, especially how to improvise with what little is available. I believe that what I learn, see, and experience in Ethiopia will be things that will help me better care for my patients in the future. After a year of sitting in a classroom and learning through books, it will be exciting to be able to apply my knowledge to real world situations. Right now, medical school is filled with listening to lectures, cramming details, and staring at PowerPoint slides. At times, I find myself zoning out during class and wondering why I’m putting myself through seemingly endless hours of studying, but then I remember the real goal of becoming a doctor: service to others and making their lives better. That’s what makes all of this worthwhile.